I made this cross mosaic a year ago or so. Maybe two now– I can’t remember. It likely looks like “sheer silliness” to many.. but to me, it makes perfect sense. 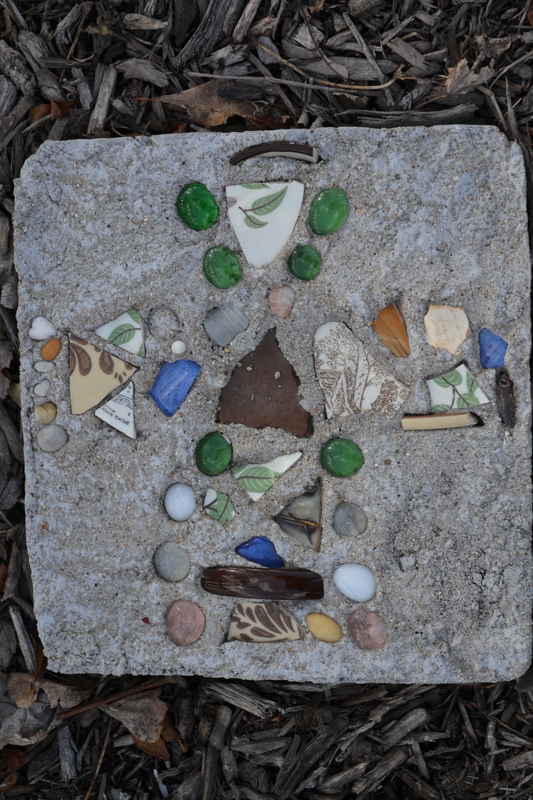 I carefully chose all the pieces of this mosaic to represent something particular. And now, every time I see it, I remember, and give thanks to God for bringing me through the season that prompted mosaic-making. 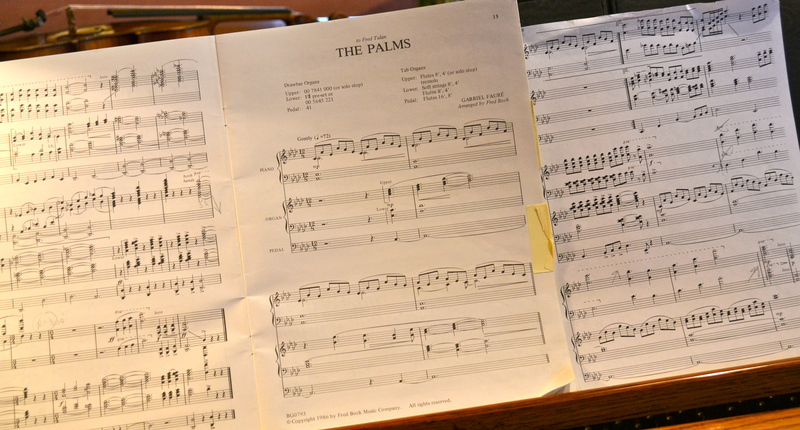 Palm Sunday. Triumphal Entry. Jesus riding into Jerusalem on a donkey, a humble animal to say the least. Prophecy fulfilled. Praises offered. One of the ways we honor this humble King today is by using our God-given gifts. On Palm Sunday at Christ Covenant, I was once again touched by the gifts within our church community. I am touched and blessed by the multitude of gifts used on any given Sunday, Monday, Tuesday, Wednesday, Thursday, Friday and Saturday. Sorry about the blank post last night. I thought it hadn’t posted, but, apparently it had. So now here’s the post and pic. Yesterday (Sunday) my body didn’t work so well. Migraine. Bad one. So bad that a few minutes before worship began, I finally realized that I had to go home and couldn’t stay for church. And that’s when THE Body, the body of Christ, stepped in. Well, before then, too.. Donna was ready to go find my keys so I could get in my house. Jim brought the keys to me. Carla accompanied me home, making sure I was home safely. Mecan read scripture. Jen, who is on vacation this week while visiting us, pinch hit for me by serving communion. Jim covered the other areas I was supposed to lead. Jen and Rob brought Kajsa home with them when church was over. I fell asleep pretty quickly, for a good hour or so. Migraine was slightly improved. Later on, Jen & Rob were out exploring the area and Jim & Kajsa were at Chinese class. I was back in bed, then realized that I was super hungry. Improvement, as earlier I couldn’t eat squat. 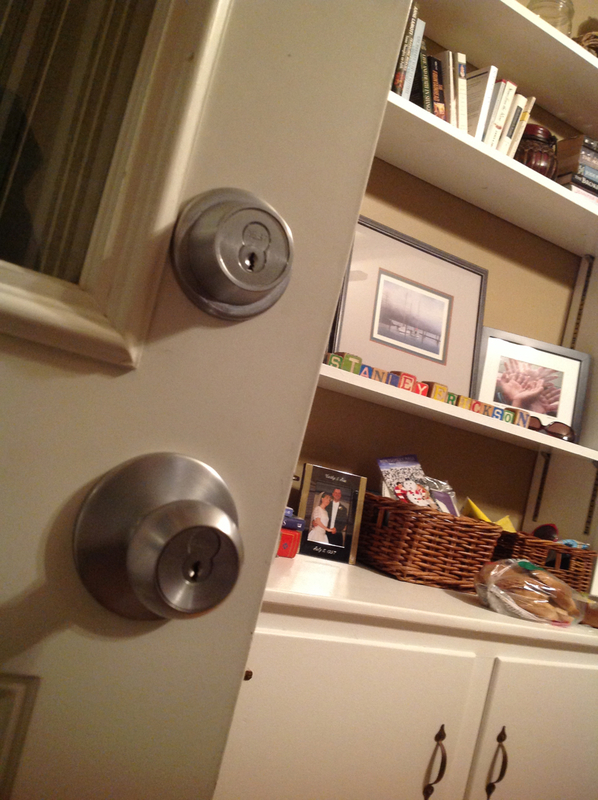 I was walking around the kitchen opening cupboards, fridge, etc.. wondering what I could eat…. it had to be something that wouldn’t make me nauseous.. something that would stay down, with a migraine… something that tasted good AND was healthy. I was thinking that I had to make my almond cluster snack, which would mean baking. Ugh. And, there was a knock on the door–a very slight, quiet knock. Uh oh. If this was a pastoral emergency, I was in no shape to be very helpful. But, I went to the door anyhow. And there was Tom. “I wasn’t supposed to wake you up!” he said. I was awake… I said. And he handed me a container of hot homemade chicken noodle soup, and some bread. I almost started to cry. I asked if he made it.. Chris did, he said. “Get back to bed.. ” Wait! I said.. let me tell you.. I was JUST trying to figure out what I was going to eat. This is perfect. Thank you! So, body of Christ… let me tell you: thank you. Thanks to all who have prayed, pinch hit, cooked, emailed, asked, accompanied, and overall been the body for me. Thank you. Ash Wednesday. 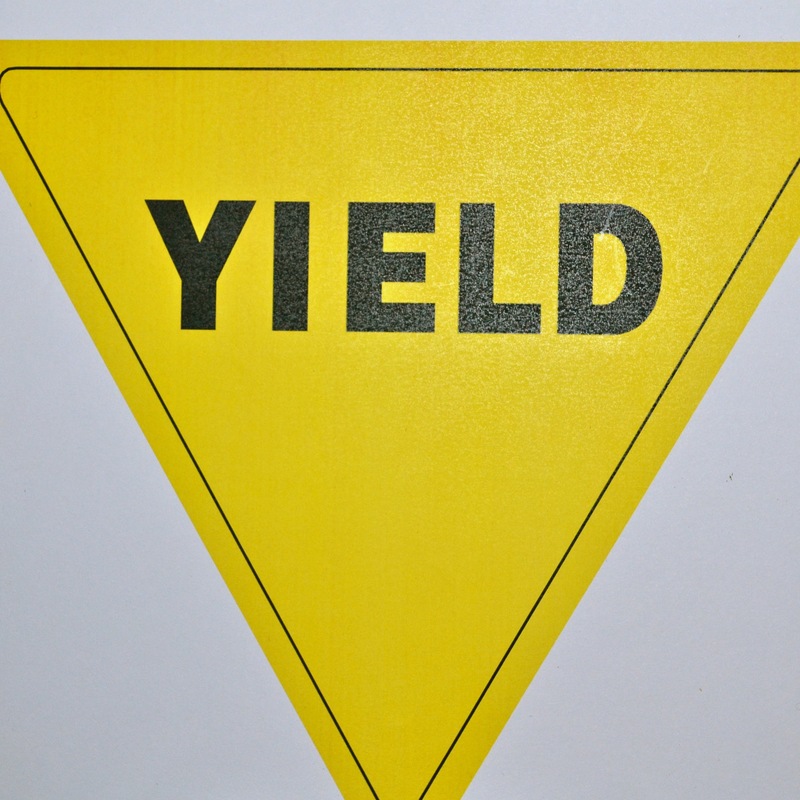 The word for the day is “yield”, as in… yielding our lives to God. Yielding the things/situations/people/etc that we hold onto… that divert us away from God. And yield them instead TO God, giving them up. In other words, our sin. I don’t mind yielding when I’m driving. Usually. The alternative would often be to get in an accident. So that’s a fairly easy decision. But the decision isn’t so easy in daily life, outside of the obvious-consequences-decisions. So yielding is a bit harder. To not yield some things to God seems so harmless… a little here, a little there… it’s not really a huge deal, is it? Maybe not. But whether or not it’s a big deal isn’t the point. The point is, am I living my life in a way that is faithful to my God, yielding my will and self and life to God… Hard as it might be, at times, to yield my day, my time, my chaotic schedule, my free time, my attitudes towards certain things, my etc… hard as it might be… I think it’s worth the effort. I love the crosses I wear. Many were gifts from people I care about, several were crosses I bought while visiting somewhere special, others were simply something I liked in a store with no special significance—just a cross I like. There are some days when I have a hard time deciding what cross to wear, because I like them all so much. Now that I’m in Holy Week, and the remembrance of THE cross is getting closer, I’m realizing something embarrassing: when I put on various crosses, I rarely think about the cross Jesus died on. Rather, I think about where the cross is from, who gave it to me, and what situation or event it reminds me of in my own life. I’ll set aside my guilt for a moment–the guilt over not focusing on THE cross when I wear my crosses. And I’ll do a bit more reflecting over the rest of this week. The cross that Jesus carried and died upon, was from the Holy Land. It was given to him by religious leaders, soldiers, ordinary people. But I wouldn’t go so far as to say that it was a gift to Jesus. The cross was, and is, a gift from Jesus. To us. Though he probably had moments of concern (12:27), this time—the cross—was the reason he came. To glorify God by saving the world. Teamwork is not a strange concept to us these days. I don’t think it’s been a strange concept for ages, actually. Though certainly a couple decades ago, I think (?) there was greater impetus among corporations, etc. to have employees learn more about teamwork. The church has been in the business of teamwork for centuries (though not always successfully). When Jesus sent the disciples off on their donkey-fetching-errand, (Matthew 21:1-11, again) he sent two of them out, as a team. My guess—and this is totally my guess—is that either one of them could have done it alone. But Jesus may have hoped they would learn and grow together, by having minister together. Clearly, by the Gospel accounts, the disciples didn’t always work well together. No surprise there. They were human, after all. But look at the result of their growth and learning and faithfulness! I am grateful for the teamwork experiences I have had in my life—especially the positive ones. I am grateful for the fact that I’m a co-pastor, and with my husband. I give thanks for the staff and ministry teams here at Christ Covenant Church. I am blessed by the friends and family members in my life who have been in my life. And I am grateful to God for giving me these people, teams, experiences, and ministry. Last Sunday afternoon, a group of people from Christ Covenant Church went Christmas caroling. Admittedly, I didn’t feel like going. I wanted to go, but I felt more like snuggling under some blankets and watching mindless TV. But I’m so glad we went. I felt better about my afternoon, and doing something for others, but the people we sang to gave me a gift–the reactions of singing, mouthing the words, motioning to a spouse when to ring one of the bells in songs, and a sparkle in some eyes that had been glossed over. Not that our short visits of caroling were transforming, life-changing, or so phenomenal. But they made a bit of a difference, at least that day. During Advent I try to follow. I try to follow the journey of wonder, of excitement–not about the secular fun Christmas stuff I enjoy so much, but about the Christ child. I try to follow the journey to the Christ child, to the star, to the humble beginnings of my Lord.. try. And I try to make a difference– in my own life and in the lives I come into contact with.. by letting Christ make a difference in mine.